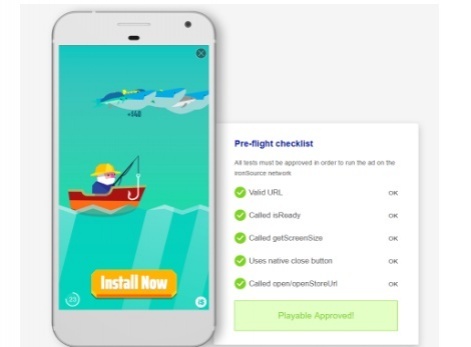 IronSource has launched a new tool for playable ads that lets marketers check for common bugs in advertisements created in-house. Playable ads are increasingly being used by games marketers, offering users a taste of a mobile game before they download the app. The Israeli company has mapped what it said are the most common bugs for the ad format. The new tool will check for them and recommend solutions should it find any issues. The tool supports the MRAID protocol and DAPI protocol - IronSource’s external protocol. IronSource said it hoped that tool would cut down the go-to-market time of playable ads and ensure they run more smoothly. “It’s impossible to miss that playables are fast becoming a new standard, like video ads once were,” said IronSource COO of mobile Tal Shoham. “By allowing users to test drive the app before they download it, with playable ads an app marketer acquires higher quality users who are less likely to churn. “Many app developers, both major developers and indie developers, are starting to get involved in the design of these ads and create them in-house.